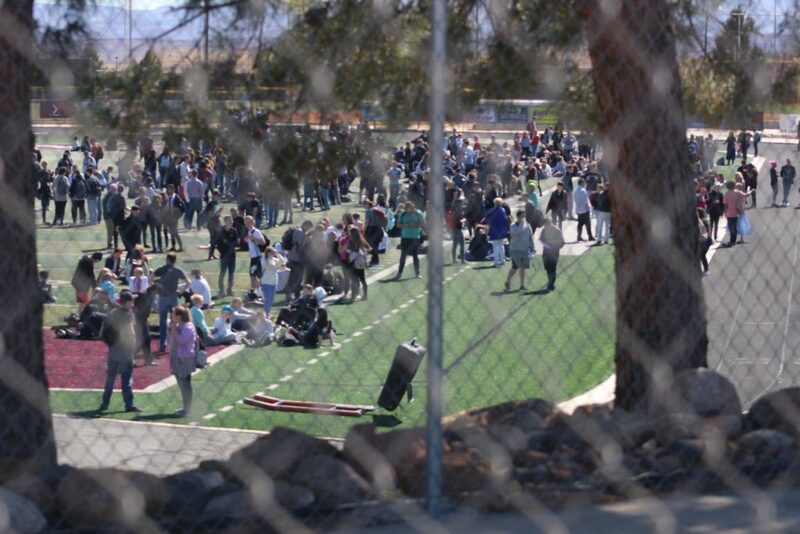 ST. GEORGE – Students filled the football field at Pine View High Monday afternoon after being evacuated from the school while police investigated a possible bomb threat. 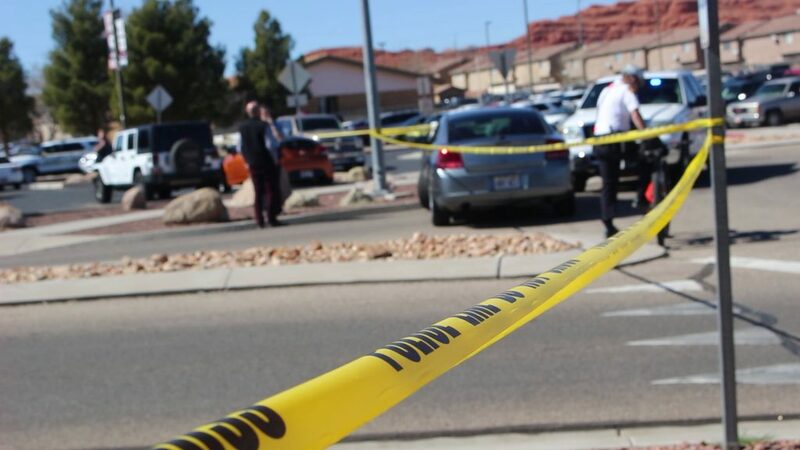 A juvenile suspect who was questioned by police in the immediate aftermath of the threat has been arrested and placed in juvenile detention, St. George Police officer Lona Trombley confirmed late Monday. 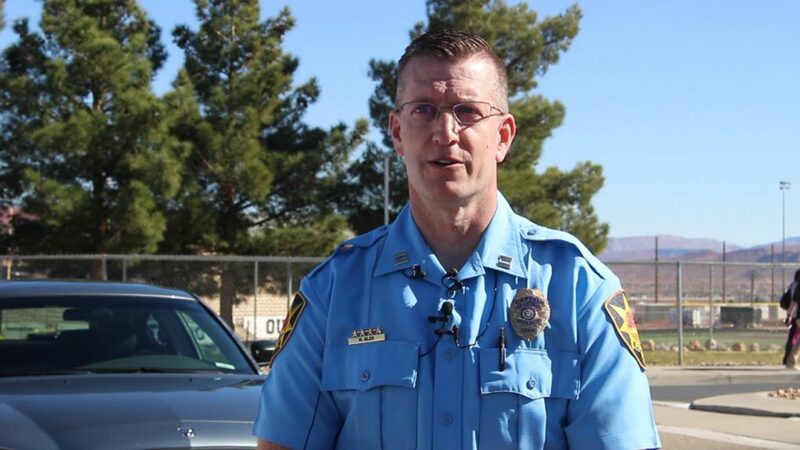 The incident started around noon, St. George Police Capt. Mike Giles said during a press conference in front of the school. 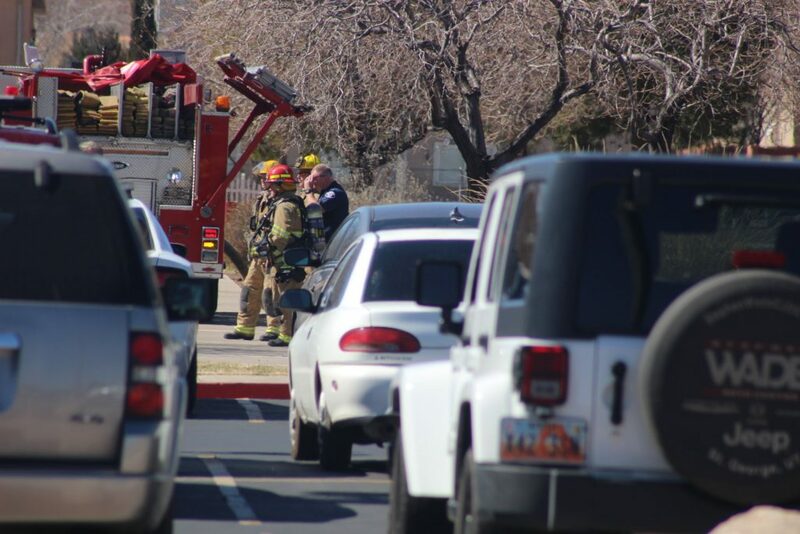 A student in the cafeteria noticed a “suspicious item” that turned out to be a backpack that had smoke coming out of it. 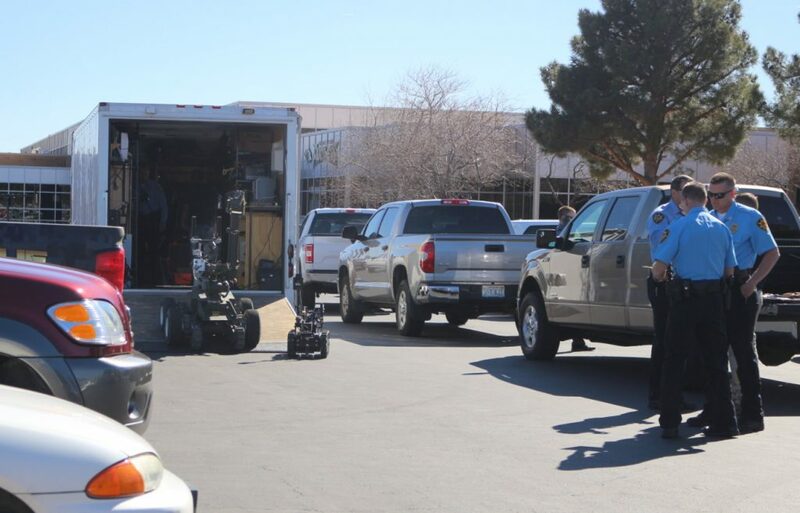 “That student found a teacher and reported the observations to the teacher who then contacted the school resource officer that was on duty in the school,” Giles said, adding that the officer also happened to be a member of the regional bomb squad. The school resource officer and his supervisor had the immediate area evacuated as they looked at the backpack, which at that time had apparently stopped smoking. At this time students began to be escorted out of the building and sent to the football field nearby. Pine View High student Jack Whalen said he and his friends were among those who initially saw the smoking backpack. He told a teacher while one of his friends went to tell the school resource officer. “One of my friends actually went and notified the police at our school; and as he was notifying, one of the teachers walked by and I stopped this teacher and said there was a backpack that had smoke coming out of it,” he said. As for the object that was smoking, Whalen said it actually looked like a box of matches. It wasn’t until the end of lunch that the students were sent to the football field, Whalen said, which made him a bit nervous. “By the end of (lunch), when fourth period had started, then they evacuated us – which kind of worried me because it took them the entire lunch period to evacuate all the students for something dangerous in the building,” he said. Giles said he was unable to go into details about the item that caused the scare, yet said it warranted the response it received. “I can confirm that there was an object in the backpack that had the potential to injure persons or damage property,” he said. 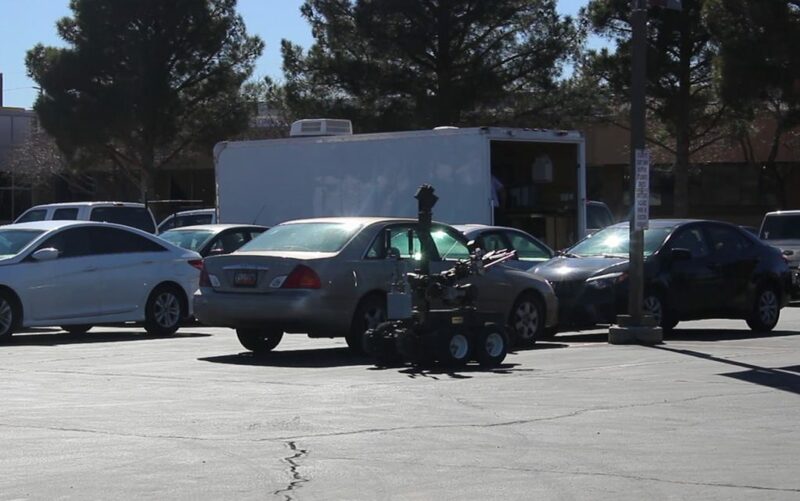 While students were being evacuated, the bomb squad was called in and additional St. George Police officers arrived at the school. Washington County Sheriff’s deputies were also present at the school, as was a fire crew from the St. George Fire Department. The FBI was also contacted, as was Dixie Regional Medical Center which employs a bomb-sniffing K-9. As the police continued to investigate the incident, some students were questioned, with one ultimately being escorted off the football field by police, Whalen said. As the person of interest is a juvenile, the police would not identify the individual. 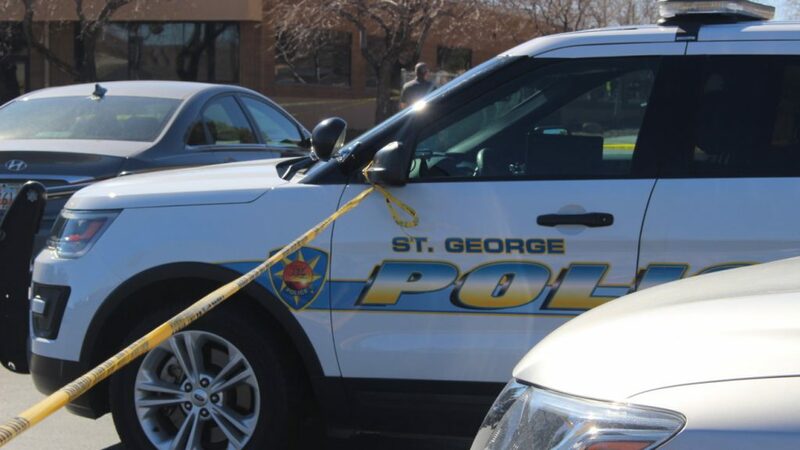 Shortly before 7 p.m., Monday, Hurricane City Police issued a statement over social media that the individual being questioned by St. George Police is also a suspect in the ISIS flag and graffiti incident that occurred at Hurricane High School last month. Approximately 1,100 students attend Pine View High School, said Steve Dunham, a spokesman for the Washington County School District. As the incident unfolded, parents were asked not to come to the school to pick up their children. Doing so would have complicated the situation at the time, both Dunham and Giles said. Students were able to leave the field in groups starting around 2:45 p.m. and were instructed they could not return to the school until the police investigation had concluded. Despite the scare to the school, Dunham said the situation “had a great outcome” due to a great response from first responders. “It has been phenomenal,” he said. “Nobody has been hurt and the students are on their way home safe,” Dunham said during the press conference. 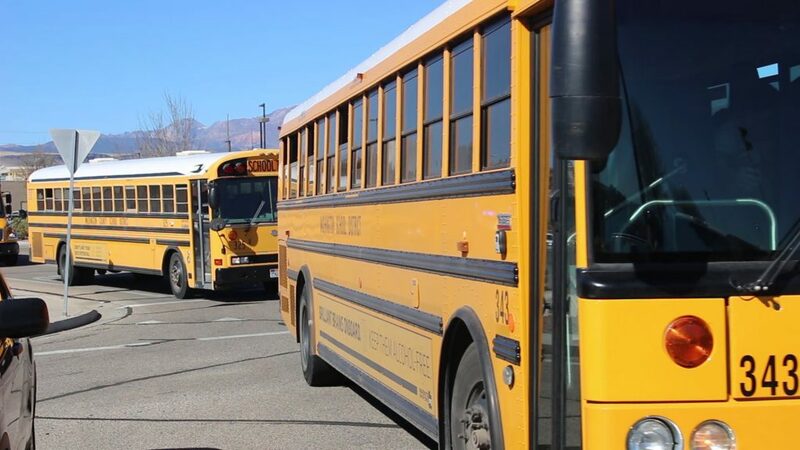 The incident also confirms the Police Department’s commitment to the school district to keep students safe through the use of school resource officers kept at high schools and intermediate schools. The school resource officers and other officers have also been “very present” in schools in the wake of the shooting in Florida, Dunham said. In the Florida incident, 15 students and faculty at a high school in Parkland, Florida, were killed in a school shooting. The massacre has since caused ongoing discussions in the political and media circles concerning school safety. 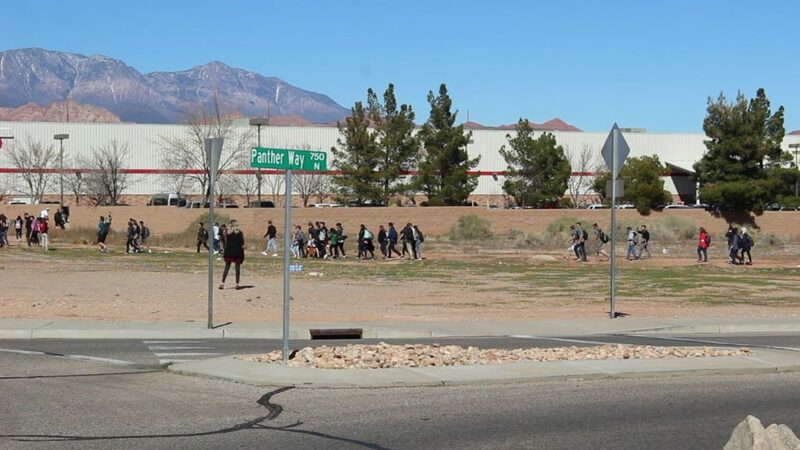 No injuries or property damage resulted from the incident at Pine View High Monday, Giles said, adding additional information may be released as the investigation unfolds. Juveniles arrested are presumed innocent until adjudicated otherwise in a court of law or as otherwise decided by a trier-of-fact. Ed. 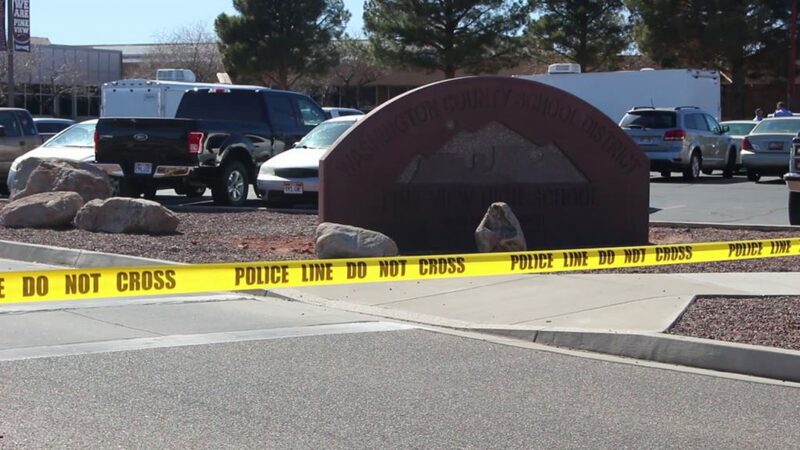 note: This story has been updated to include confirmation from St. George Police officer Lona Trombley concerning the status of the juvenile allegedly involved in the Pine View High School bomb scare. It’s almost like the circus has come to town. Teenies do stupid stuff like this. When I was in HS a kid lit off firecrackers in the hallway. Nobody freaked out and went nuts back in those days. And we didn’t automatically assume it was some degenerate psycho shooting up the school. If this is the reaction to some delinquent teeny lighting a backpack on fire in the parking lot I’d say the terrorists have actually won. Everyone lives in “terror” of bombs and mass shooting? or maybe we just got wayyyyyyyy too many bored cops who should be out doing traffic. This kid, if it’s proven that he did this, needs to stay quite a while in juvenile detention then on to jail. The more attention these nuts get, the more copycats. I’m just glad there wasn’t a shooter, having the kids flee from a bomb to the football field would be perfect to have a shooting massacre. How smart was that? What’s wrong with parents today? Any charges for the parents?